This is an Automatic Electric Automatic Number Identifier (ANI). It was used to determine the calling number of a CO line or PABX extension for billing purposes. When the caller dialed a toll or outside number (depending on whether the ANI served a CO line or PABX extension), a special ANI trunk was used that connected through a Centralized Automatic Message Accounting (CAMA) center. After the desired number was dialed, the CAMA office would return an off-hook condition to request the identity of the calling extension. At that point, three separate parts of the ANI would work together to detect, decode and transmit the calling number as a string of Multi Frequency (MF) digits. 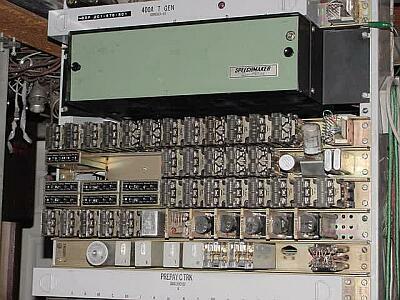 It's really a remarkable combination of electromechanical logic with just a little electronic circuitry thrown in. Shown here are the two ANI trunks. These connect directly to the CAMA office. After the called number is dialed, the CAMA office requests the trunk to report the calling number. The trunk then lets the Sender know that it needs attention. The Sender then selects the Trunk. The Sender, after selecting the trunk, requests the Detector to determine the identity of the calling extension. 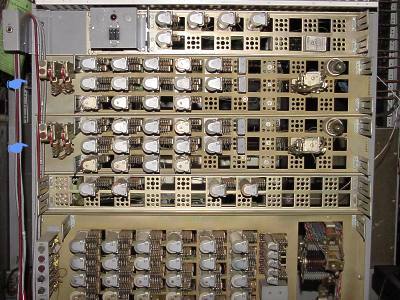 A 36 contact bar relay, located to the right of the repeat coil, is used to connect the Sender to the Detector. 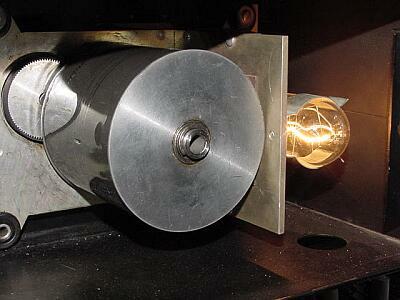 One Detector can serve multiple Senders but only one at a time. One Sender can serve up to 25 trunks. It is actually possible, with proper configuration, to serve multiple switches in one CO building with a single ANI unit. The Detector applies a pulse of 60 VDC to the control (C) lead at the Trunk via the Sender. The pulse follows the C lead through the switch train to a unique terminal that is associated with the calling line or extension. From there, it goes to a network of neon lamps and diodes which determine the directory number that will be billed. 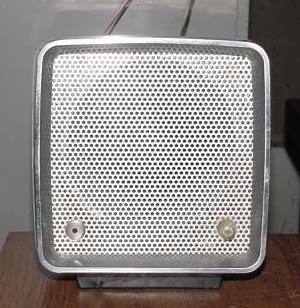 The neon lamps and solid state components are located in the card cage. Because the neon lamps require some ambient light to fire reliably, a fluorescent lamp is used to provide sufficient illumination to assure that they will operate when needed. 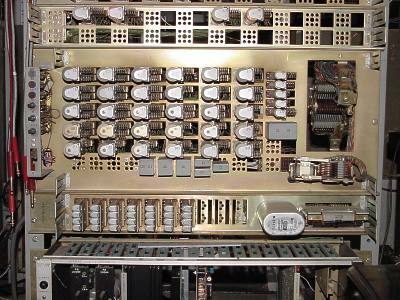 The derived number is stored as a string of seven 4-bit words in the array of relays shown above the power supply card cage. The Detector is then released. The Sender then sequentially converts each four bit word into a "2 out of 5" representation of the digit which is delivered to the MF generator. the resulting MF digit is then fed to the trunk for transmission to the CAMA office. After all seven digits are transmitted, the Sender releases the trunk. At that point, only the trunk is "busy" while the Sender and Detector are free to handle other calls. The MF generator is the circuit board on the right of the cage. 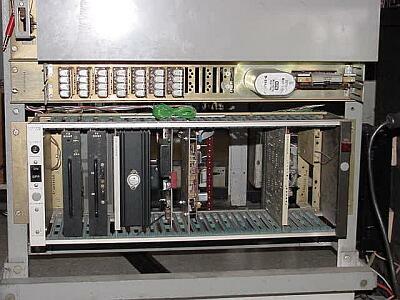 The Detector power supply occupies several slots on the left. 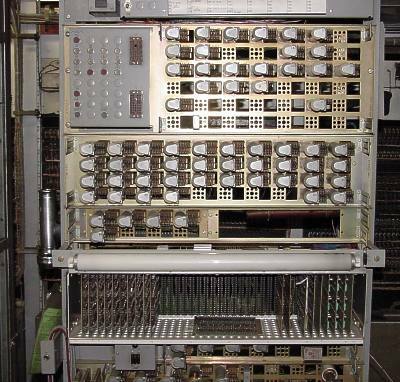 For this application, the CAMA trunk is connected to a Western Electric Automatic Number Announcer (ANA). 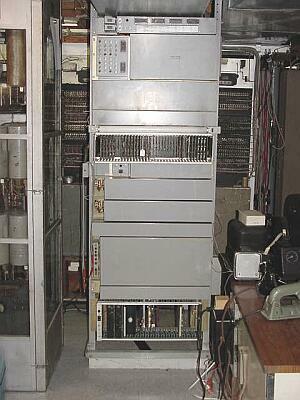 The ANA was used to identify an unknown CO line to a telephone installer. It consists of the MF decoders, storage relays, steering logic and a very unique voice announcing device called a "Speechmaker." The Speechmaker was made by the Cognitronics company which, although still in business, would probably not admit to ever having made such a device. A spoken announcment of the directory number is dynamically composed by sequentially selecting one of ten sound tracks that are photographically printed on a rotating cylinder of transparent film. Each digit of the number has a separate track that is selected by switching the output of the proper photo diode to a common amplifier located in the Speechmaker unit. It's pretty impressive just hearing all of the mechanical elements doing their thing. To provide the full effect, I connected the ANI trunk to a monitor speaker and recorded an operation with a microphone so that the mechanical sounds, MF signaling and number announcement can all be heard at once. Click on the picture to hear it.